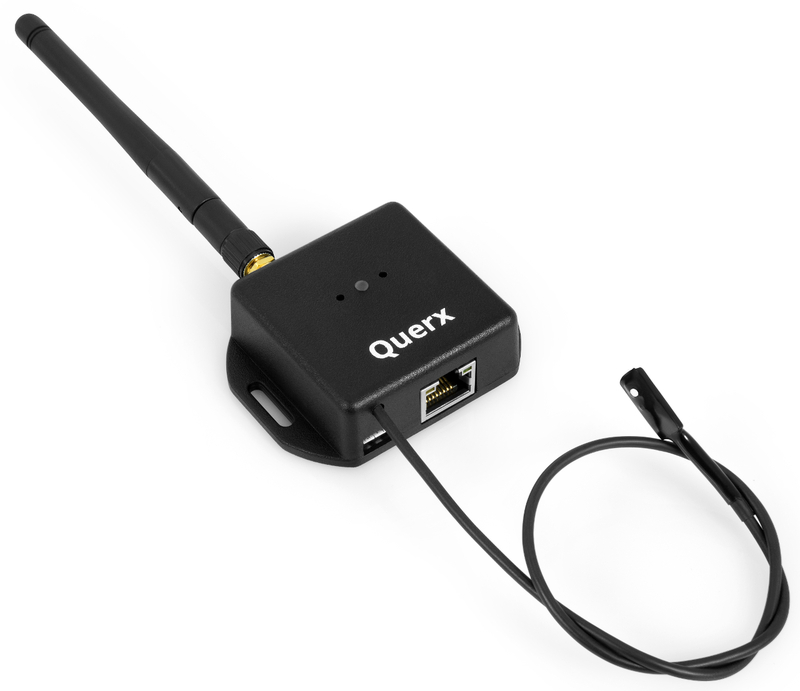 Querx WLAN TH has integrated sensors for temperature and humidity. They are oil-repellent, splash-water and dust proof. You can connect the device to you network either over an Ethernet cable or over the wireless interface. The unit's small dimensions allow installation even in confined spaces. Power supply for the wireless web thermometer / hygrometer is done over a free USB port or using an external Micro-USB power adapter. Measurements and system time are stored persistently, and are thus still available even after a blackout. Querx TH is can be used everywhere, where continuous measurements and monitoring is necessary. Applications include server-rooms, museums, laboratories, pharmacies, production plants or food hygiene. An optional accredited calibration allows the use of Querx TH as test equipment for quality-relevant fields of applications in accordance with ISO-Standards (ISO 9000ff). Temperature, humidity and dew point calculation over integrated sensors. Configurable logging interval. Capacity: 4 million records, 7.5 years (1 / min) to 350 years (1 / h). Data export as CSV and XML. Temperature / humidity: too high, too low; rising too fast, dropping too fast. Dew point: too high, too low. Encrypted e-mails, SNMP traps, syslog messages, audible and visual alarms. HTTP/S (XML, CSV, JSON), Modbus/TCP, SNMPv1, Syslog. Xively and ThingSpeak. World wide data access over web and mobile apps. 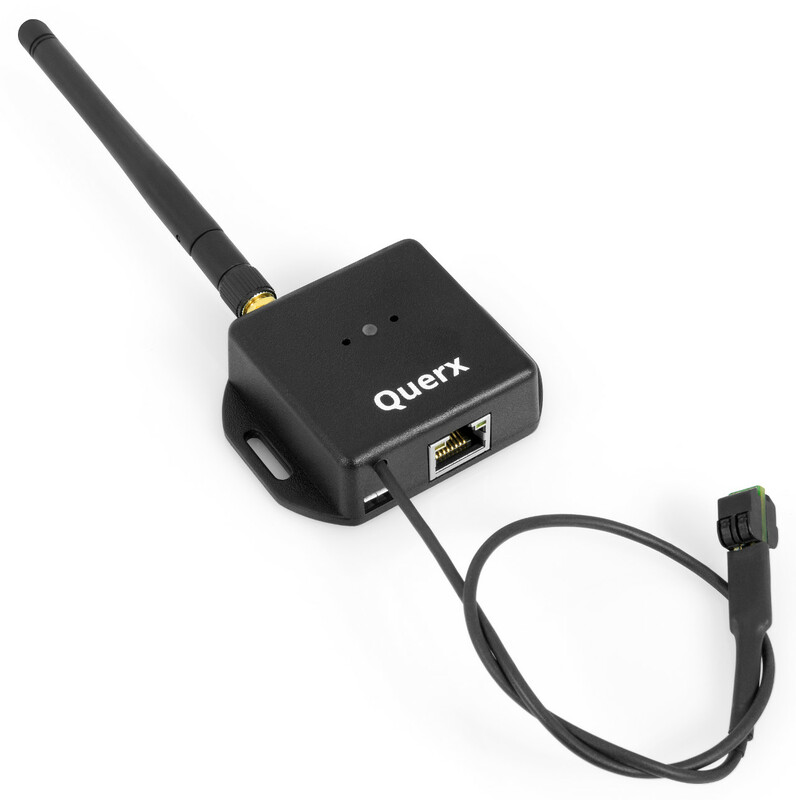 The WLAN thermometer Querx WLAN PT supports any 2-, 3- and 4-wire Pt100 and Pt1000 temperature probes. You can connect the device to you network either over an Ethernet cable or over the wireless interface. The unit's small dimensions allow installation even in confined spaces. Power supply for the networking-enabled thermometer is done over a free USB port or using an external Micro USB power adapter. Measurements and system time are stored persistently, and are thus still available even after a blackout. Querx PT is used everywhere, where continuous and precise measurements and monitoring is necessary. Applications include server-rooms, laboratories, pharmacies, production plants or in food hygiene. An optional accredited calibration allows the use of Querx PT as test equipment for quality-relevant fields of applications in accordance with ISO-Standards (ISO 9000ff). Temperature over any 2-, 3- and 4-wire Pt100/Pt1000 probes. Configurable logging interval. Capacity: 4 million records, 7,5 years (1/m) to 350 years (1/h). Data export as CSV and XML. Detailed information on the product page sensors.egnite.de. Do you have questions or do you need an individual quote?